2017 was a year of big games and game events that saw some awesome moments, like massive victories, and announcements that left fans hyped up and excited. 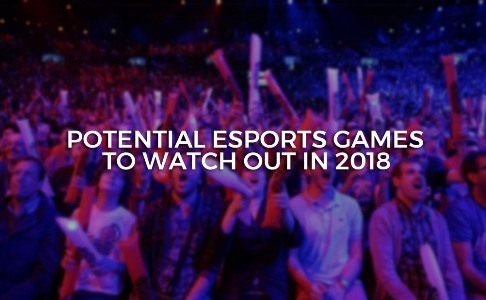 With 2018 about to arrive, expect the gaming scene to continue to grow and become exciting. Esports has gained a great amount of footing over the past few years, with 2017 being one perhaps the biggest years of the young sport. Some of the most popular esports games include League of Legends, DOTA 2, Overwatch, Call Of Duty, Battlefield, Hearthstone, Street Fighter V, Counter Strike: Global Offensive, and much more. These games have spawned a highly competitive scene with the best of the best aiming for the grand prize. As the next year rolls in, there would be a few more games that aims to become esports staples in the near future. Here are some potential esports titles that you should play. Back in the 1990s and the early 200s, the Quake series was one of the most popular shooters around, and it helpedlay out the foundation on which the early days of esports would be built on. With the latest release of DOOM being met with positive reactions, the new Quake Champions aims to follow that up in a big way. For those who are not too familiar with the franchise, Quake is a series of multiplayer arena shootersin which the goal is to score as much kills as possible. There were other game modes as well, one of which was the chaotic capture the flag. Quake Champions aims to recapture the fast-paced and gory action of the previous games, which would definitely translate well into HD. From one arena shooter to the next one,Unreal Tournament is also another big shooter during the early 2000s that aims to come back in a big way. Like Quake, Unreal Tournament is a fast-paced arena shooter that looks like it could fit in the current esports scene. The game is currently on alpha testing, but the early reviews look great, with some saying the game has that same engaging and addictive gameplay of the previous installments. One of the most successful games of 2017 is Player Unknown’s Battlegroundstook the world by storm with its addictive and competitive gameplay. The game is a Battle Royale type, which means that players are deployed on the map without any weapons or equipment, all of which would be in different areas of the map. Whoever is the last man standing becomes the winner. The game requires a lot of skill and precision to master, along with some good strategy and communication. With a large player base and a solid following, PUBG has all the makings of another esports classic. Fighting games are home to some of the most intense and competitive esports gaming events around, and Marvel vs. Capcom Infinite looks to join the party. Another installment in the famous Marvel vs. Capcom series, the latest title aims to make the action bigger and badder. With a massive list of characters, and lots of moves to learn, this could be another big fighting game that could give established titles like Street Fighter V and Injustice 2 a run for its money. Esports has been running well and getting bigger each passing year, and with these wonderful slew of titles, we are bound to see more excitement and competition in the next coming years.